This article was written by Eric Wilkins. TULSA, Okla. — The scene opens in the Mohawk Sports Complex. The sidelines are packed with spectators in one of the most anticipated games of the weekend. Denver’s Inception and Austin’s Doublewide are going toe-to-toe in the 3rd place game-to-go to Nationals. How did we get here? Saturday pool play went to seed for the top four teams. Bravo, HIP, Doublewide and Inception won their pools, setting up crossover games against one another. Bravo swiftly handled Doublewide 15-7, but on the other side of the bracket, HIP had to battle it out with Inception. HIP opened up an early lead to take half 8-5. With tenacious defense, Inception brought the game back to 11-10. After an exchange of points, the game closed out with HIP besting Inception 13-12. In the semifinals on Sunday, we saw Bravo take care of business against Inception, solidifying the sense that Bravo was playing on a different level than the rest of the competition. In a region with three bids to Nationals, Bravo didn’t have more than nine points scored on them and finished all seven games with 15 points, all while continually throwing a football on the sidelines. The other semifinals games saw the top two Texas teams going blow for blow in a classic slugfest filled with chippy calls, huge layouts, and big skies. By the time double game point rolled around, most of the other games had wrapped up: a mass of players and spectators surrounded the field. Doublewide received the pull from HIP at 12-12, double game point, with a Nationals bid on the table for the winner and another two games for the chance to go to Nationals for the loser. HIP’s Matt Bennett got a block but a foul was called on the throw. The observers ruled no foul, giving HIP the chance to clinch their first-ever bid to Nationals. But Doublewide got the disc back after a HIP upwind huck fell short. Doublewide began driving down the field again with patient handler movement and under cuts. However, a low throw just yards away from HIP’s endzone clipped the grass and gave HIP another chance to go upwind to take the game. Mitchell Bennett stayed poised and controlled the disc, hitting long unders to his receivers and eventually finding Kai Marshall. He put a sultry upwind flick to a streaking Ben Lewis who caught it in stride. HIP and the sideline erupted as the South Central saw, finally, a new team qualify for Nationals. A disappointed Doublewide had to shake off the loss and get ready to go for their next two games for a chance to clinch the third and final bid. Doublewide first stepped into a game against Arkansas Dreadnought, the top team out of the Ozarks Section. Dreadnought was not going to pass up the opportunity to compete at the next level and gave Doublewide a game. Eventually Doublewide’s young talent and experienced leadership helped pull away and finish the game 14-9. With Dreadnought filtering players from College DIII powerhouse John Brown University and the University of Arkansas, this team could be one on the rise. On the other side of the bracket, Inception took on Dallas Plex. The two teams had already met in pool play as the 4 and 5 seeds, respectively, with Inception taking the first matchup 15-7. When this game rolled around, though, Plex already had an idea of how to beat Inception’s zone and Plex captain Brian Hoffman found several receivers for hammer scores over the Inception mids. In the end, Inception’s superior talent shown through as they closed out a comfortable 15-9 victory. The stage was now set for Inception v. Doublewide. The two teams have both showed through the season that they are prepared to compete at Nationals, with Doublewide the long time veteran of Nationals and Inception the number one contender two years running. Doublewide began on defense. David Brooks got the first block of the game and threw to Ryan Purcell for the break. 1-0 Doublewide. Both teams were on fire, as high pressure defense from Inception, particularly with the zone and force middle, generated turns. Denver capitalized to take the break back and claim their first lead at 3-2. Both teams offense’s trade to bring the score to 8-7 Inception at halftime, on serve. I imagine halftime went something like this for Doublewide: Dan Emmons screams inaudible words with the occasional “Let’s go!” and “We’re not letting them beat us!” whilst the new guys start to channel the fire Dan is bringing. In the other huddle, I imagine Inception’s captain Ryan Lacy fires up the troops with a Gladiator-esque monologue about the pride that comes with playing on this team and the heart to put your body on the line each point. Doublewide started the second half on offense; a beauty of a pull settles in the back of Doublewide’s end zone. 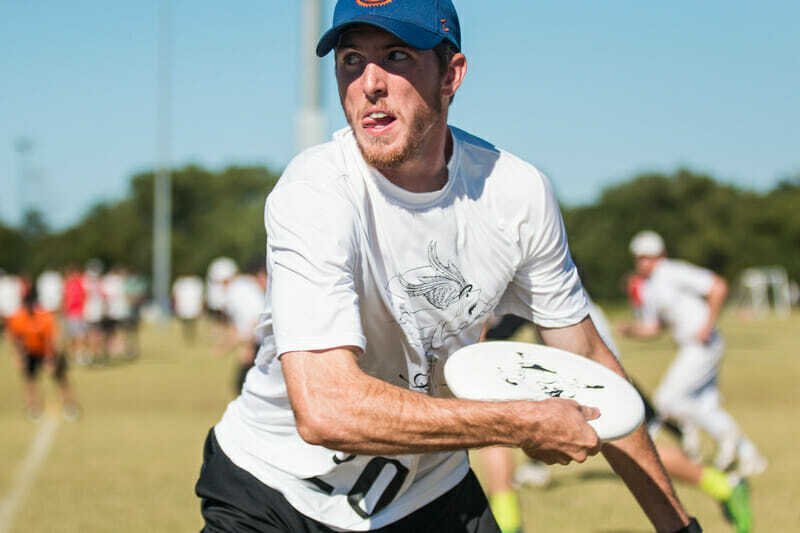 Inception’s Andrew Priester gets a Callahan! 9-7 Inception. Inception’s zone continued to give issues to Doublewide’s offense on the following point. After several turnovers from both sides, Doublewide finally closed out the point making it 9-8. But the momentum remained with Inception. They went on a 3-1 run to take a 12-9 lead. The soft cap horn sounded. Game to 14. Doublewide’s offense continued its struggles against the zone, as Jay Dunlop was absolutely relentless on the middle mark for Inception. Austin veterans Jeff Loskorn and Jason Best, however, start going over the top of the zone and stretching the field to bring the game within one, 12-11 Inception. Inception scored to make it 13-11, setting up a chance to clinch the Nationals spot on defense. Inception was one score away from upsetting South Central Royalty. Malecek, maybe in an AUDL mindset, didn’t hesitate to bomb the disc to the end zone with two receivers and two defenders playing backyard jackpot. The disc is initially blocked by Inception in a crowd but it was hit into the air. Chase Cunningham came down with it on the second effort play to get Doublewide within one. As the score is confirmed by the observers, the hard cap horn blows. Shortly after, so did my mind. As you are probably aware, the hard cap means game over if one team is ahead at the end of the point; you play one more point only if the score is tied. When the hard cap blew in this game, I heard some people on the sidelines cheering for Inception thinking the game was over because they were up 13-12. This, however, was incorrect, because the new point had already started when the hard cap went off. Just imagine the circumstances that led to this point. Had Inception’s defense held tough for five more seconds, Inception wins. Had a foul call in the pile of four people in the end zone stalled the point, Inception wins. Had no one on the sideline said, “10 seconds to hard cap,” Inception wins. Doublewide pulled off the exceedingly rare USAU buzzer beater to breathe life into one more point. The game was not over. Inception’s offense got set and took the field. They began to work it downfield with a fired-up Doublewide defense smothering every cut. Inception’s offense gave up the disc and gave Doublewide a chance to tie. Not once but twice in this point, Best bailed out his throwers on long and low passes with full extension layout grabs. Doublewide, knocking on the door to the upwind end zone, found Michael Matthis for the score. 13-13, double game point. Inception’s offense got set again. You can tell they are still poised and that they are going to take the easy throws; they aren’t going to take unnecessary shots. They hit the first few cutters, working it to near midfield when a routine forehand up the line is turfed. The Inception defense plays force middle and Doublewide patiently waits for the cutters to get open, eventually finding Best for the score and the game, 14-13. Doublewide finished the game on a 3-0 run. What a Regionals! I have played all my years of club in Texas and have watched and played a lot of ultimate. I love seeing two teams so hungry and passionate battle it out as the teams did this weekend: A 13-12 finish in the semis, a 14-13 finish in the game to go. HIP challenging the status quo, earning the region an extra bid, beating Doublewide. Inception pushing to overtake the perennial powerhouse falling short by mere seconds. Doublewide’s young players carrying a large load with the turnover the roster saw this year. Bravo playing lights out. I can’t wait to see what Nationals brings. Comments on "South Central Men’s Regionals Recap: Bravo Dominates, HIP Qualifies, Doublewide Survives"